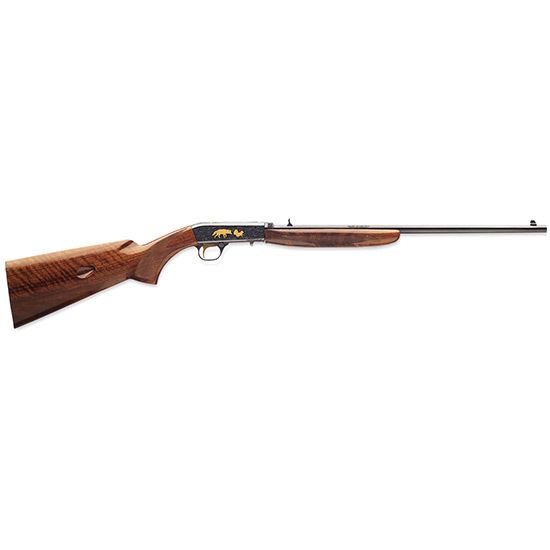 Browning 021002102 Semi-Auto 22 Grade VI Semi-Automatic 22 Long Rifle (LR) 19.3 10+1 Walnut Stk Blued in. Brownings SA22 is one of the first autoloading rimfire rifles ever made and one the most desirable. It is meant to be enjoyed in the field and as heirlooms. The slim forged steel receiver and slender barrel takes down into two compact units without tools. Its receiver is machined from steel which features Grade I engraved scroll design. The barrel features precision rifling and is drilled and tapped to accept your scope mount. The SA22 also has an American walnut with checkering and a polished gloss finish gold bead front sight with an adjustable rear and manual triggerblocking safety.This model has a 19.3 barrel blued receiver with engraved game scenes with 24 karat goldplated game species and a gold plated trigger."